Sola has been deliciously quenching your thirst for nearly 20 years. 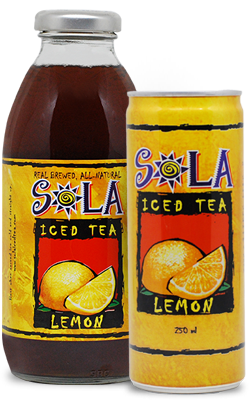 Sola has become the country’s favorite iced tea. Using only the finest natural fruit flavors and real tea leaves, Sola continues to deliver the best tasting iced tea to quench your thirst. It took us almost two years of product development to perfect a recipe that we believe is a true representation of the original recipe of iced tea and what we think iced tea drinkers would really enjoy. At the moment, Sola has 7 flavors: Sola Lemon Iced Tea, Sola Peach Iced Tea, Sola Raspberry Iced Tea, Sola Apple Iced Tea, Sola Orange Iced Tea, Sola Strawberry Iced Tea and Sola Apple Iced Green Tea. We are continuously in the process of developing many more flavors and variants. During the 1904 St. Louis World’s Fair, trade exhibitors from around the world brought their products to America’s first World’s Fair. An exhibitor named Richard Blechynden, a tea plantation owner planned to give away free samples of hot tea to fair visitors. Unfortunately for Richard Blechynden, a heat wave hit the area and very few visitors wanted hot tea during the fair. To save his investment of time and travel, he dumped a load of ice into the brewed tea and served the first iced tea. The concoction was a hit and iced tea was born. The history of tea began in ancient China over 5,000 years ago. According to legend, Shen Nung, an early emperor who was a scientist and patron of the arts, mandated that all drinking water be boiled as a hygienic precaution. One summer day while resting after a long journey, his servants began to boil water for the entourage to drink. Dried leaves from a bush accidentally fell into the boiling water. As a scientist, the Emperor was interested in the new liquid, drank some, and found it very refreshing. And so, according to legend, tea was created. Sola iced tea comes from a company that is passionate in its quest for healthier alternatives to quench your thirst. We don’t believe we need expensive ads or a superstar endorsement to give you a truly delicious and refreshing drink; only a commitment to create special beverages of unparalleled quality for everyone to enjoy. Sola is a simple mixture of black tea leaves, natural fruit flavors, water and sugar. Sola is a ready to drink, non-carbonated and non-alcoholic beverage. Sola Iced Tea is all natural and real brewed using only the finest ingredients. No artificial preservatives, colors and flavors are used in the production of Sola. Sola is pasteurized and vacuum packed in a durable 473-ml glass bottle. It incorporates a safety metal cap that pops up when the original seal is broken. The water used in the production of SOLA undergoes a treatment called Reverse Osmosis. Reverse Osmosis is one of the best methods known today to purify water. Sola Lemon Iced Tea is brewed from real tea leaves mixed with the deliciously tangy flavor of lemon. Taste sunshine and happiness in every sip of Sola Lemon Iced Tea. Ingredients: Water, Sugar, Black Tea, Natural Lemon Flavor, Citric Acid. Sola Raspberry Iced Tea is the perfect combination of sweet and real brewed goodness. Every drop is packed with a refreshing raspberry taste. Ingredients: Water, Sugar, Black Tea, Natural Raspberry Flavor, Citric Acid. Life isn’t peach perfect but Sola Peach Iced Tea sure is! The Peach flavor stands out every time you take a sip. Ingredients: Water, Sugar, Black Tea, Natural Peach Flavor, Citric Acid. Make your tummy feel berry special with Sola Strawberry Iced Tea. Experience sweet berry bliss in every bottle. Ingredients: Water, Sugar, Black Tea, Natural Strawberry Flavor, Citric Acid. Orange you glad Sola Orange Iced Tea exists? Drink this to add a little splash of flavor to your day! Ingredients: Water, Sugar, Black Tea, Natural Orange Flavor, Citric Acid. Don’t tell the others but Sola Apple Iced Tea is the apple of my eye. Plenty to sip in a bottle but I’m not willing to share. Ingredients: Water, Sugar, Black Tea, Apple Flavor, Malic Acid. Pretty sure we have the recipe for happiness right here. One sip and a-pple in love with the clean taste of Sola Apple Green Iced Tea. Ingredients: Water, Sugar, Natural Apple Flavor, Green Tea Aroma, Green Tea Extract, Ascorbic and Malic Acid. Now in 250ml Aluminum Cans! 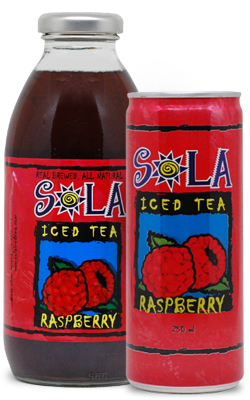 Sola Iced Tea, Lemon and Raspberry, is now also available in 250ml ALL ALUMINUM cans. Our solo size cans is the perfect size to carry around. We chose to offer a can version because aluminum is one of the most recyclable materials, reducing our carbon footprint even more. All tea comes from the leaves of one plant, Camellia sinensis, which is processed into four tea types: White, Green, Oolong and Black. Regional conditions in the various tea-growing area of the world determine a tea’s profile, and one tea type can be quite different from another of its type in color, body, flavor and aroma. In the case of Black Teas, the differences are noted in the names, which often are taken from the districts in the countries where they are grown. Variations include such names as Assam (India), Ceylon (Sri Lanka) and Yunnan (China). For all four teas, the main point differentiating them comes from processing. After being picked from the Camellia sinensis plant, both White and Green Teas remain as unoxidized teas, Oolong Tea is partially oxidized, and Black Tea is fully oxidized. Oxidation occurs when enzymes in the tea leaves are released and the leaf responds to the oxygen in the environment, causing the leaves to turn a bright copper color. Basically, processing gives Black Teas a more full-bodied and robust taste and Green Teas a more delicate, fresh taste, while Oolong Teas fall somewhere in between. Since only the tips are used and the processing is minimal, White Tea has the most delicate flavor of all. Tea is among the richest natural sources of antioxidants, which have been linked with cancer prevention, decreased risk of stroke, and reduced blood cholesterol. Additionally, it has trace amounts of various nutrients such as the amino acid theanine; the minerals calcium, magnesium, manganese and potassium; and the vitamins C and K.